Are you getting adequate sleep at night? Are you always tired during the day? These are questions that you should be asking yourself. Part of keeping your loved one healthy and happy means putting yourself first. Your own health and physical limitations should never be compromised. After all, you want to give your loved one the absolute best care. In many cases, a memory care community is the best option to provide the care and support your loved one requires, while allowing you to live your life without the stresses of being a full time care-giver. It’s normal to have a few medications to keep track of with age. So if you notice that your loved one is having difficulty remembering when and how much of their medication to take, it may be time to look into assisted living or memory care communities. This way, neither you nor your loved one will have to worry about a medication schedule – it will be managed by a friendly and knowledgeable staff instead. You’ll have peace of mind that your family member or friend is staying up to date on their medications. A healthy diet filled with all the right vitamins and minerals is essential to keeping your loved one able bodied. Is your parent getting adequate meals when you aren’t there? Sometimes going to the grocery store and preparing meals can be too much to handle. And if your loved one isn’t getting adequate nutrition, their health could suffer. Senior living communities are designed to ensure that your loved one is getting healthy and delicious meals each day. Especially if they are unable to adequately eat enough calories due to Alzheimer’s or dementia, the staff in memory care are specially trained to help monitor and track eating habits for overall health. Staying social is very important for your loved one – socialization reduces stress and even decreases feelings of loneliness and depression. 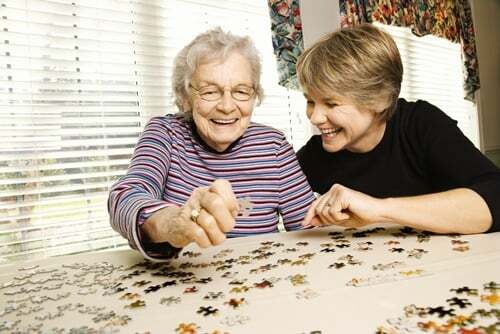 If you find that your parent ventures outside less often or stops spending time with friends and family, the specialized memory care programs available may be the best option. This gives your loved one a safe area in which they can socialize with other people, make new friends, and feel comfortable while doing so.